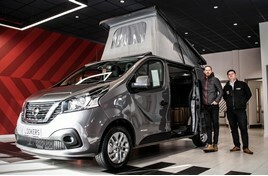 Lookers Nissan has introduced a new campervan conversion service, helping holiday makers get the most out of the British spring and summer “staycation boom”. Lookers’ local business development manager, fleet, Josh Tyerman, said: “We’re very excited to be offering this bespoke service that allows our customers to transform the Nissan NV300 into their dream campervan." It is the first Lookers Nissan dealership to offer the service directly and will allow customers to seamlessly purchase the campervan of their dreams thanks to a wealth of options and spec. Tyerman said: “It’s a brand-new service for Lookers Nissan and we hope that, with the recent warm weather getting everyone talking about the upcoming spring and summer, that our customers will be looking to make their stay in the UK this year that extra bit special."